Don't you wish all the best kids toys were sold in one place? Did you know a place like that already exists?! I recently found it and I'm warning you, it's easy to get lost there, daydreaming about all the ways your baby, toddler, or kid would play with these imaginative, top quality toys. This place is Oompa! If you are an Eco-minded parent and concerned about the safety of toys (like lead and other chemical content), you will appreciate the selection and how the toys are grouped and organized. Have a thing for German toys? Want to search everything made in Europe? No problem! You can search by which country the toy is made in! Genius if you ask me. You can search by category, age, brand, country, and use the handy gift finder. It makes shopping for gifts just so much easier if you ask me. When Baby E was about a year old, we got her a wooden doll stroller (that you see in the background of the photo above). While it may seem like a very similar item, it is far more flimsy compared to a Haba product. It will last until the kids grow up, but not much beyond that. Moreover, it can't be used for learning to walk, it tips over with just a little pressure on the handle. This Haba wagon however is specifically designed to aid in your little one's first steps. Baby T loves it, the smile on his face is priceless when he is holding onto it and walking. At 8 months all he needs is some security with my hand behind him and other than that he is pretty much walking on his own. Baby T is also delighted with the Allez-Hopp Clutching Baby Toy! I recently noticed how he thoroughly enjoys moving little objects, turning and inspecting small parts, anything 'mechanical'. I was first enamored with the Haba Discovery Wagon because of those interactive elements that I thought he would love. Since that wagon wasn't available at the time, I really wanted a 'busy toy' for him that he would enjoy aside from the wagon we received. This clutching toy is perfect for his interests, it develops fine motor skills and is visually appealing to any baby. It looks like something he will be playing with for a while. It's perfect to distract my super wiggly boy while I change his diaper, when he is in his highchair waiting for dinner, and while they are playing with his big sister and I am working. This toy has a great price of $25.19! 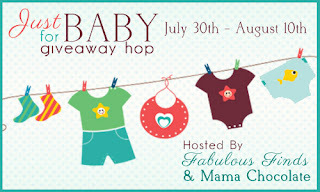 You'll be on your way to getting one when you enter the $25 gift card giveaway during the Just for Baby event. One other thing we love about toys at Oompa and especially all the Haba toys they carry is that most of them are gender neutral. I love that! I am very much anti pink-everything for girls and blue-everything for boys (not to mention mostly plastic). Oompa carries many brands that are timeless, classic, yet modern. We love their line of Uncle Goose items, Under the Nile, Tegu, and GeoToys. Plus you get Free Shipping everyday on orders over $65! They have everything from balance bikes to puzzles and musical instruments. Dreaming here for sure, but I wouldn't mind getting rid of our [plastic or Chinese] toys and replacing them with these fabulous finds at Oompa! 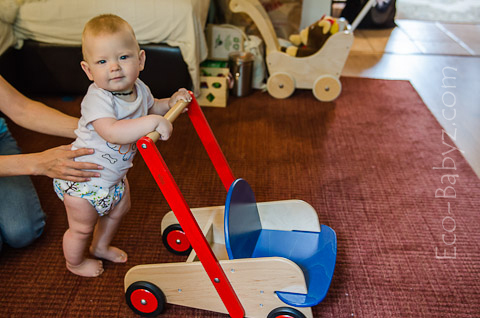 I love wooden toys and that walker looks so awesome! Except I think my daughter will want to sit in it and make my husband and I push her around (she does that with all her doll strollers and shopping carts)! How cute! I love that most of their toys are gender neutral and organized by country. I will definitely have to check out the toys on their website. I love that Oompa offers wooden toys...they are my all time favorite! Thank you so much for this review! I love wooden toys and your little T is so cute! What cute pictures of Baby T with those wooden toys! I love wooden toys and Oompa's site has such a great variety! My husband and I have been talking about getting rid of the cheap plastic toys that people have given us and starting to replace them with higher quality wooden and organic toys. This website will be a great resource! Don't mind me saying this, but I think the search function is one of my favorite parts of this company. I love Amazon, for example, but I have the worst time trying to actually find anything I'm looking for because the search specifications are far too broad! I love all of the wooden toys, especially the pretend food products. They are wonderfully sturdy and great for gender neutral play. Wooden toys are PERFECT. They really are timeless; you can keep them for generations without them "going out of style"
Oompa is so great - I like to look on there for good classic and safe toy ideas. I adore wooden toys, now that my daughter is crawling having wooden drums or wooden blocks scattered all over the room i don't have to worry too much if she picks it up and start chewing on them. This walker looks great something i would like to have. love their wooden toys...get tired of the plastic! Love that they make wooden toys. I, too, hate using so much plastic and try to avoid it as much as possible. It's so hard to find high quality toys these days. So glad I found this resource! Oh, I'd love to have that walker! I love the German toys, too. You sure do have photogenic kids -- they promote these products very well.